Today, we are going to continue exploring the set of publications aimed to explain Propy’s development plans. In our previous publication we explained why governments and politicians should be interested in implementing of Propy’s platform or even may compete to implement it in the first wave. And now we would like to focus your attention on the very important question of legislative changes. At first, reformers will have to deal with each country, state or even local community separately since they all have their own regulations in the field of real estate. And this is the most challenging part, as each implementation will require a unique plan for legislative and organizational changes. Therefore, we have developed a methodology allowing us to create a plan for any particular situation. This methodology contains preconditions of the implementation and outcomes which can be achieved in the result of a reform. The scheme below (or click link for full resolution) was presented among posters during IFCA 2017 conference in Malta. 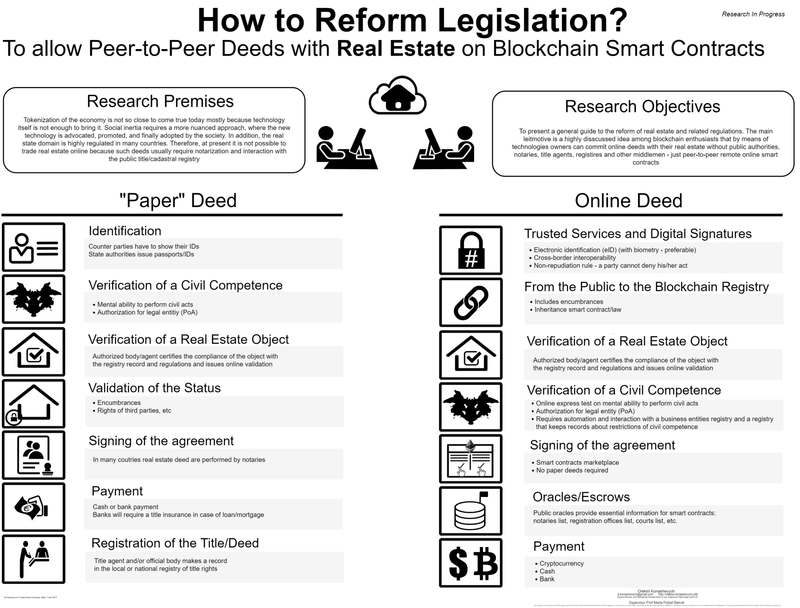 On the left side, it presents a typical current “paper” deed process. It may be similar to the actual deed process in many countries, but there can be some differences, which is not critical at this stage. On the right column, there are key steps that must be achieved before introducing our reform. It is the representation of an “ideal scenario” for real estate P2P transactions. 1. Electronic identification with digital signatures which guarantees that parties may act remotely without the need to meet each other and their acts would be recognized by the government as legal binding. As far this condition is met by many countries (for example EU has eIDAS regulation, other countries have similar regulations), there are no obstacles, except the interoperability, meaning that local regulation shouldn’t accept only local digital signatures as legally binding so for example, a person from Dubai shouldn’t have to come to U.S. to get a local digital signature if he wants to buy property there. It is also important that we recognize a necessity to use smart ID-cards with biometry (fingerprints, retina etc.) to guarantee parties a high level of security. 2. Regulation on transferring existing records from “paper” or electronic central government registry to the blockchain on the Propy’s platform (this will be explained in a paper about the “soft” plan of implementation). 3. Real estate inspections such as technical conditions of the object, fire security, architecture regulations, community approval, taxation etc; to our point of view, these actual regulations should be significantly reduced or simplified if a government wants to attract more investors. 4. Verification of civil competence — there are different approaches (which will also explore in our next papers) in different countries. In most countries, there is a formal procedure where a notary or a civil servant checks the database of people with limited civil competence or any restrictions on civil act and does similarly with legal entities. Cross check through the business registry and some other registries will give the ability to automate this process. 5. Signing agreement is what parties do online with their digital signatures but first, they chose on the marketplace a template of the smart contract that best fits their needs. The marketplace is an open space for developers and lawyers who create legal and IT solutions (smart contract is a mix of both: program scripts and legal provisions) for different situations: purchase, mortgage, lease, rent, lifelong contracts, superficies, emphyteusis. 6. Oracles are what the government must maintain; each jurisdiction may adopt some specific online regulations (let’s call these “smart laws”), or public oracles to store sensitive information and provide with external information to execute smart contracts; We need public oracles (owned by governments) to solve issues on arbitration, inheritance and some other issues. 7. Payment, of course, is an inevitable part of any purchase and we recognize the need to make automated bank payments and to add cryptocurrencies to create complex smart contracts for different business purposes. 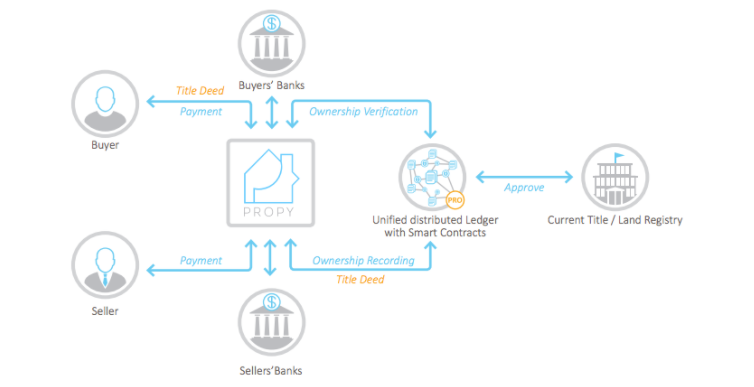 Follow this series to learn more about Propy’s plans on implementing the first real platform for P2P transactions in real estate.